Travel by SUV on this tour through the Cascade Mountains to Leavenworth. With fantastic evergreen trees in the forests and valleys, this is a trip not to be missed! Enjoy the rivers, streams and waterfalls on the way to a wonderful Alpine village, Leavenworth WA. This 9 hour tour includes information about the towns history as well as geology and heritage about the sights along the way. 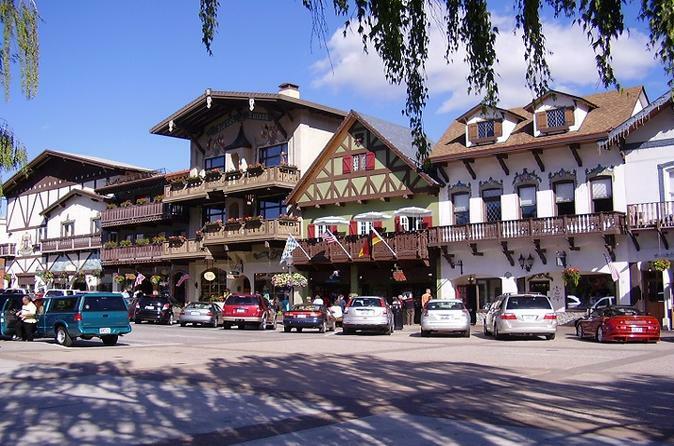 From your local hotel, B&B, airport or pier, off you go to Leavenworth, a Bavarian wonderland! This former railroad town transformed itself into a beautiful mountainous Bavaria after the railroad moved. It is amazing at Maifest with the May pole dances, during Oktoberfest in October, and during the Holiday Lights in December when they light up the entire town. Winter, summer — with or without festivals — is a good time to see Leavenworth. You'll see waterfalls along the way, as well as the beautiful and majestic Cascade Mountains various mountains on this scenic trip. Depart a 9:00am, stop at Snoqualmie Falls, the cross Snoqualmie Pass. Next is Blewett Pass, then time on your own in Leavenworth to enjoy the town. Depart 3:00 from Leavenworth and cross Stevens Pass, traveling through old mining towns on your way back to the city.